After nearly 30 years of availability, electronic health records (EHRs) have arrived at the forefront of healthcare policy and practice. HITECH Act incentives are driving widespread adoption. New "meaningful use" requirements and certification timelines are forcing many practices already using EHRs to reconsider their systems and their longer term goals. This whitepaper serves as a guide to identifying an under-performing EHR and replacing it with a solution that delivers results. 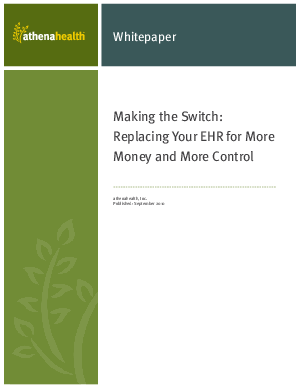 It offers answers to a number of common questions about EHR adoption and replacement and demonstrates how the right EHR can help practices get more money and more control, freeing up physicians to focus on patient care.